The fulfilment in Christ Jesus of the first three feasts of Israel. Please note: All the blue highlighted scriptures are linked to biblegateway.com to read online if you click on them. 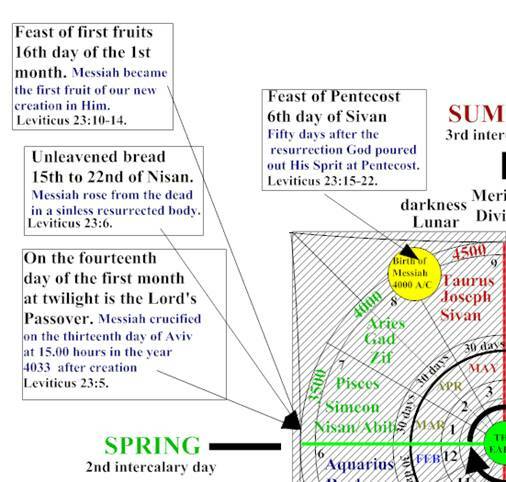 The first three feasts of Israel consist of the 14th 15th and 16th days of the first month Aviv/Nisan Leviticus 23:5-14. Aviv is the beginning of the civil/financial year which consists of three hundred and sixty four days: fifty two weeks’ times seven days exactly Jesus’ death burial and resurrection occurred exactly on these days according to scripture and its calendar. Firstly the days start evening to morning in reference to Gen 1:5. Jesus said: For as Jonas was three days and three nights in the whale's belly; so shall the Son of man be three days and three nights in the heart of the earth Mat 12:40. The first day of the biblical month is the new moon. The crucifixion took place on the thirteenth day of the first month Friday at 15.00 hours the (ninth hour Matthew 27:46), three hours before Saturday the 14th Passover. The resurrection occurred on the first day of the week Sunday three days later, the 16th day of the first month. The fifteenth day of the month is full moon… The first three feasts are prophetic of the death/Passover crucifixion of Christ Jesus the Messiah of the nation of Israel and all the sins of the world John 3:16. Messiah Jesus was and is the sinless sacrifice symbolised by unleavened bread when the yeast is symbolic of sin and the resurrection Jesus being the first fruit of all creation for as in Adam all die, even so in Christ shall all be made alive 1Co 15:22. In the story of the Exodus, the Bible tells that God inflicted ten plagues upon the Egyptians before Pharaoh would release his Hebrew slaves, with the tenth plague being the killing of firstborn sons. The children of Israel were instructed to mark the doorposts of their homes with the blood of a spring lamb and, upon seeing this, the spirit of the Lord passed over their homes and their firstborn would be spared, hence the term "Passover". When Pharaoh freed the Hebrews, it is said that they left in such a hurry that they could not wait for the bread to rise. In commemoration, for the duration of Passover, no leavened bread is eaten, for which reason it is called "The Festival of the Unleavened Bread".Matza (unleavened bread) is the primary symbol of the festival. This bread that is flat and un risen is called Matzo. "Aviv" accordingly also means spring, one of the four seasons. Thus the major modern Israeli city of Tel Aviv means "Spring Hill".The month in the Hebrew calendar when the barley has reached or passed this stage (Exodus 13:4; 23:15) is called Aviv, or the "month of the aviv": the first month of the Jewish civil year, and the seventh month of the Biblical prophetic year. Aviv begins on the new moon of this first month the true Spring equinox. Since the Babylonian captivity, it has also been called Nisan (Neh 2:1). On the sixteenth day of the month, harvest was begun by gathering a sheaf of barley, which was offered as a sacrifice to God (Lev 23:4-11) Jesus was resurrected on the sixteenth day of this month Aviv 4033.6 years after the biblical creation in the sign Aries the sacrificial lamb. Jesus walked with the disciples for forty days after the resurrection Acts 1:3 and then ascended into heaven. Ten days later fifty days after the resurrection comes the fulfilment of the feast of Pentecost originally when the law was given through Moses at Sinai meaning fiftieth when the Holy Spirit was poured out in grace and truth John 1:17 in the upper room Acts 2:1. If you look carefully at the diagram above left you will see that the sun is positioned between Aries the eighth sign of the Mazzaroth in Job 38:32 and Taurus the ninth sign. These two signs which are symbolic of the sacrificial Ram Lev 5:15 and Bullock Exodus 29:1-14 of the old covenant for filled in Christ at His death on the cross. If you click here you will see the whole calendar in context. The Sun which is symbolic of the Son of God is positioned four thousand years after creation at the time of the death burial resurrection ascension of Messiah fulfilled to the day and month according to the law of Moses. Just as the Sun rose for the first day on the fourth day he was created Gen 1:14-19 so the Son of God rose four thousand years from the day of creation when He became flesh and dwelt amongst us John 1:14. In conclusion the Sun was in the year fourthousand in the age of Aries in the month of Abib/March the first month in the biblical calendar. At the time of the death and resurrection of messiah the moon was in the fourteenth fifteenth and sixteenth days full in Abib at the time of the ripening of the barley/grain hence the name of the month Abib or Nisan: - Abib, ear, green ears of corn according to Strong’s ref H24 .